L'avion has been on my radar for a while. The creation of Jo Scahill, L'avion is a boutique accessory company based out of Sydney. It's collections are based on some of my favourite cites such as, Paris, New York, London and one place I have not been to, the Hamptons. 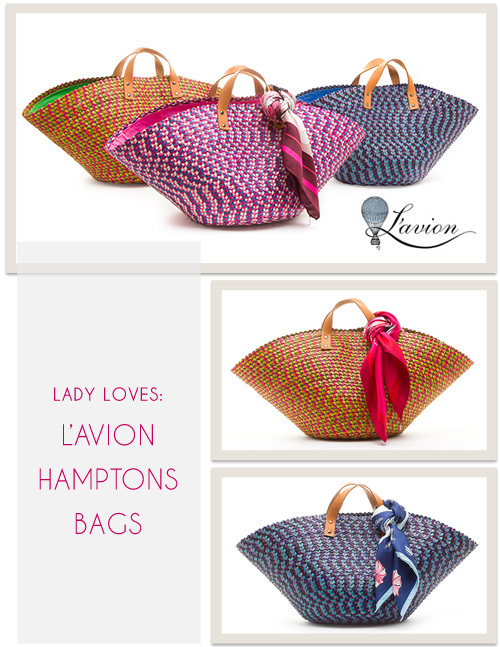 L'avion have just released their Hamptons Bags. These lovelies are handmade and have natural leather handles that come in three great colours. Beach blue, paradise pink and lawn green. This bags are perfect for a picnic in the park, a day at the beach or a for a visit to the local farmers market. The Hamptons bag is chic and is a great bag for pretty much any occasion. I am putting the beach blue colour on Lady Fable's wish list for Christmas. If you go to the L'avion website be sure to check out the complete range. I love the ribbon scarves and Jo's Blog. I have been inspired to wear a head scarf tomorrow!